From hawker stalls to restaurants, these Bib Gourmand recipients serve some of the city-state’s most delicious food. Despite being one of the world’s most expensive cities to live in, Singapore boasts cuisine that is surprisingly affordable and incredibly delicious. Blessed with a multi-cultural heritage, the city-state’s culinary scene is diverse with elements drawn from several ethnic groups including the Malay, Chinese, and Indian. Recently, the Michelin Guide Singapore 2018 released the official list of Bib Gourmand recipients for the year, bringing to light some of the best eats in the Lion City. 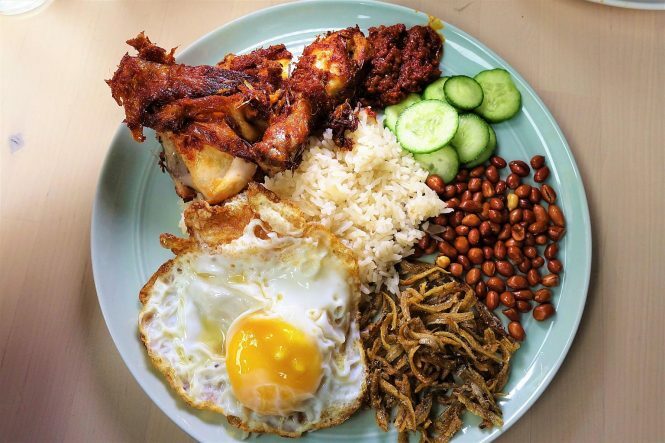 For the uninitiated, The Bib Gourmand list recognizes restaurants and street food establishments offering quality cuisines at a maximum price of US$32 (S$45). The 2018 selection includes 50 addresses, with 17 first-time awardees. 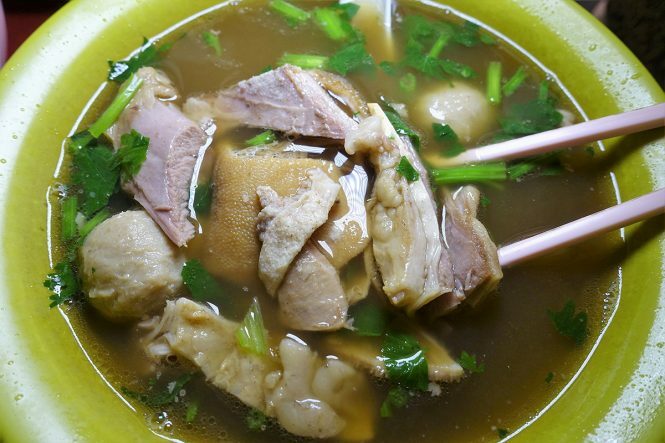 Local favorites include Chai Chuan Tou Yang Rou Tang, a hawker stall at Bukit Merah View Food Centre, which serves steaming hot bowls of mutton soup served with rice and homemade chili sauce. Another comforting treat is the clay pot frog porridge at Eminent Frog Porridge, prepared with silky rice porridge and various flavorful sauces. For a satisfying snack on the go, check out Rolina Singapore Traditional Hainanese Curry Puffs, helmed by 79-year-old Tham Niap Tiong, who once learnt to make the curry puffs from a Hainanese sailor back in the 1950s. 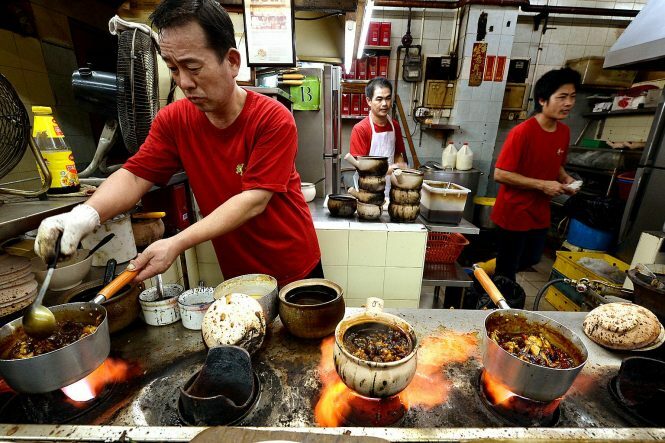 Those familiar with the popular Singapore dish of char kway teow (stir-fried rice noodles prepared with fishcake, sweet Chinese sausage and cockles), ought to make a beeline for these two fried kway teow establishments who been awarded the Bib Gourmand distinctions for the very first time. Lao Fu Zi Fried Kway Teow at Old Airport Road and Outram Park Fried Kway Teow both serve delicious renditions of the dish. Another hawker stall making its debut on the Bib Gourmand list is Tai Wah Pork Noodle, which is well known for its springy flat egg noodles with minced pork, meatballs and dumplings, swirled in a piquant, vinegary sauce. Aside from these hawker stalls, two restaurants have also made their way onto the list for the first time. Muthu’s Curry serves a mean South Indian-style fish head curry; while The Coconut Club is loved for its creative take on the nasi lemak dish, by using premium ingredients such as Thai jasmine rice and fresh coconut sourced from a unique hybrid of coconut in Perak, Malaysia.